Melt butter and chocolate in a large bowl in the microwave for 1 minute. Stir, continue heating at 20 second intervals until chocolate is completed melted and smooth. Allow to cool. Preheat oven to 350 F and line an 8x8 baking pan with parchment paper, allowing parchment to hang over the sides. Add sugar to the chocolate and stir until combined. Add eggs and beat with wooden spoon or rubber spatula until combined. Stir in vanilla. Stir in the flour and baking soda just until combined. Spread the batter into the prepared pan and bake for 30 minutes. Allow to cool completely in the pan on a wire rack. Combine butter and cream cheese in a medium mixer bowl and beat until creamy. Gradually add the powdered sugar a cup at a time, mixing thoroughly after each addition. Continue to beat on medium speed until light and fluffy, 3 to 4 minutes. Add the peanut butter and beat until thoroughly blended. Frost the brownies while still in the pan. Remove brownies from pan by lifting the sides of the parchment and place on a cutting board. Cut into bars. 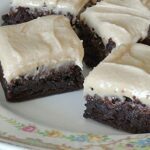 This recipe for One-Bowl Fudge Brownies with Peanut Butter Frosting was printed from AmandasCookin.com - https://amandascookin.com/one-bowl-fudge-brownies-with-peanut-butter-frosting/ and can only be printed for education or personal use.